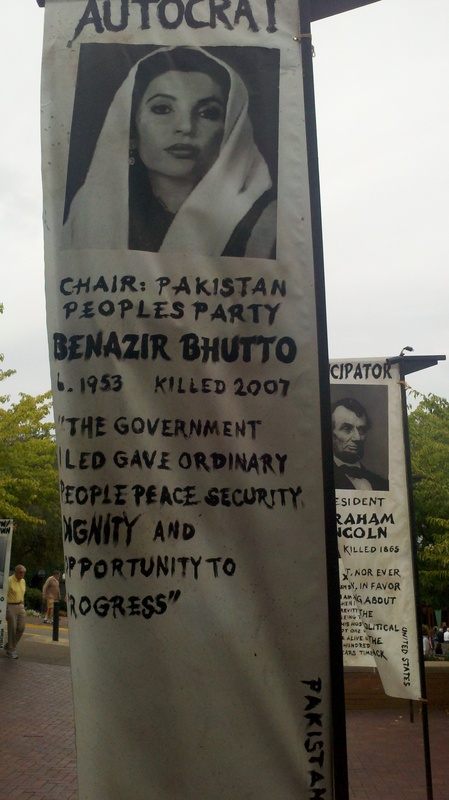 In the lobby and courtyard of the theatre, the production team created large banners with two interpretations of assassinated politicians with quotes on either side supporting the title. 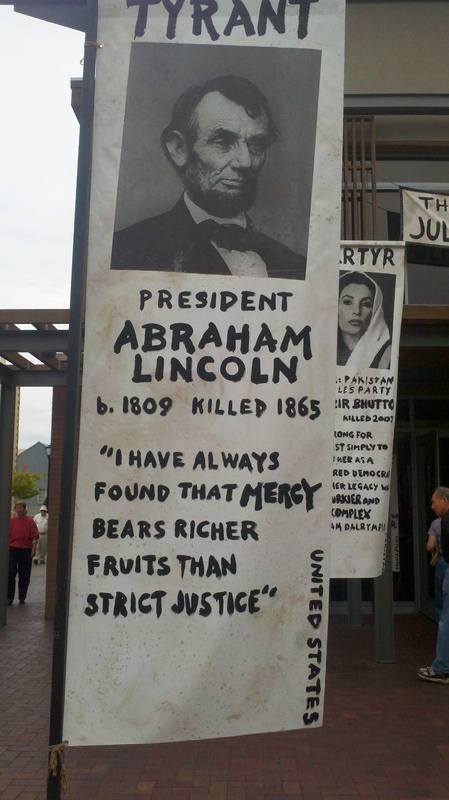 For instance, Abraham Lincoln had one side labeled TYRANT and another EMANCIPATOR. They presented the play in the round in a blackbox space with a female Caesar. Calpurnia was cut from the story, and there was a greater focus on the text. The play had a timeless feel. One character took pictures with a digital camera, they fought with quarter staffs, in one scene they used a gun, and they stabbed Caesar with knives. The costumes also reflected a timeless quality with a focus on flowing or draping fabrics. The actors were in the theatre as audience came in and they spoke with audience as actors, not as their characters before the show. There was also an element of audience participation. Whenever Caesar lifted her arms the audience was asked to applaud, stand, scream, and cheer. Sometimes this level of audience dependency comes off annoying, however the effect worked well and propelled the audience immediately into the story. Because we were in the round we felt conspiratorial with the assassins and then during Marc Antony’s speech, we felt allied with Caesar. I enjoyed that there was never clearly a right or wrong side. The audience became a hive-mind answering to whomever was giving you a more compelling cause to action. I must say that this play employed many conventions I happen to love, including theatre in the round, actors on stage at the start of the show as actors not as their characters, bare stage, double-casting, gender-blind casting, emotional intensity, and live sound effects. I have never seen Julius Caesar staged and I don’t know if any productions after will live up to this. I had always assumed that in order for the play to be successful the audience would have to believe that Caesar was righteous and good with no possibility of Brutus being in the right. The production instead showed two sides of everyone – the just and the vengeful; righteous and hypocrite – which made the play all the more powerful and made Brutus, Marc Antony, and Caesar all too human. The play is more about mob mentalities than justice. Brutus kills Caesar for Rome, not for personal gain, but he’s easily swayed into a mob sense of justice as I never believe Cassius acts in Rome’s best interest but his brother’s. Marc Antony with his amazing speech is able to convince the community to take up arms to revenge Caesar’s death. The murder of the poet Cinna was wonderfully staged to showcase this sense of Rome spinning out of control with blood lust. One of the most successful uses of the space was the utilization of live sound. During the scenes in which Cassius is talking about the ground shaking, and portents of doom, the actors and crew banged on the seats in a random-rhythmic way from behind, sending at a loud vibration up my spine at random intervals. They also lit the catwalk at one point, while the stage was completely dark and actors talked in low light center stage adding to the Brechtian no-seriously-this-is-a-play, we’re-in-a-theatre, aesthetic-distance-is-awesome way. An element I had not considered until seeing the play is the righteous suicides throughout the story. Portia, Cassius, Brutus all commit suicide it seems to protect themselves from a greater shame. In a way it feels anti-Shakespearean. We do not see a good guy vanquish a bad guy, which adds to the duality presented by the play. Are their actions for the greater good? Or, are they selfishly motivated?